If you want the data for your race analyzed, please contact Vania Nikolova, Ph.D. at vania@runrepeat.com. 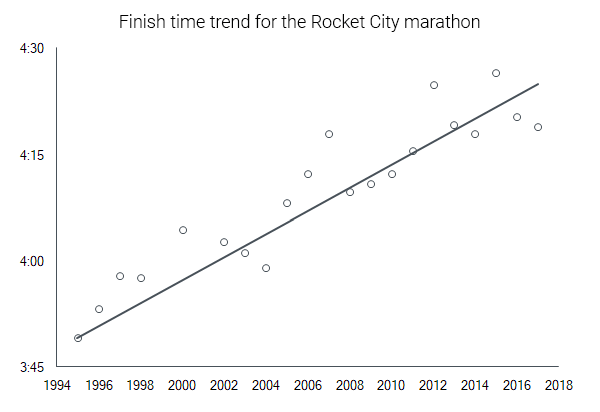 We have analyzed the data for the Rocket city marathon from 1995 to 2017 and we have found that the participants are slowing down. And this trend is statistically significant. 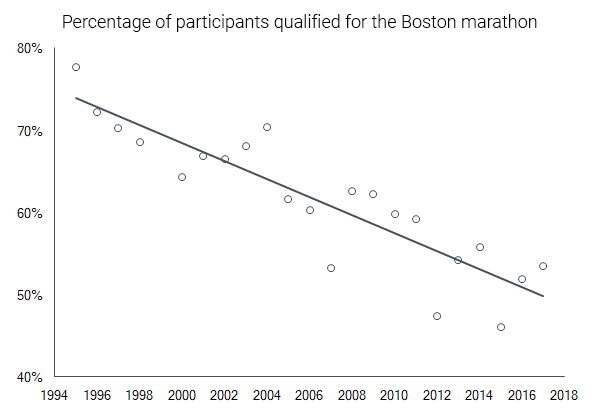 Because the Rocket city marathon is a Boston qualifier we also looked at the percentage of qualifiers - and it's dropping. There is a lot of reasons why this slowing down could occur. We'll show here that the most popular assumptions do not hold sway. The reasoning is that the rising popularity of marathon running and the ubiquity of marathon events are attracting more and more participants. These participants aren't well prepared and they are dragging the average finish time up. For the Rocket city marathon, this reasoning is wrong for two reasons. 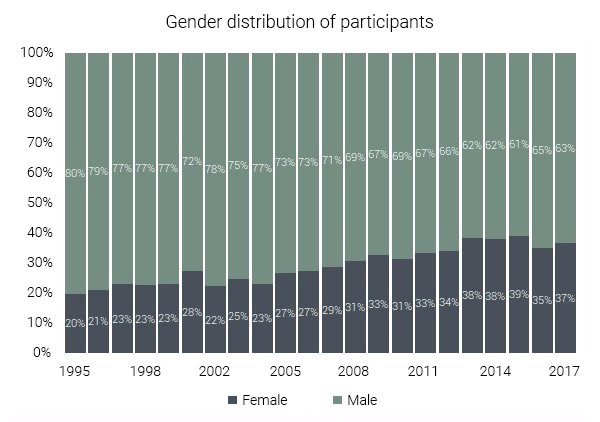 First, the number of participants is not consistently rising. 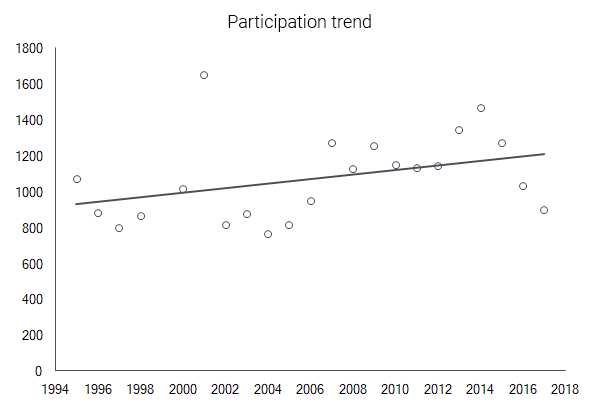 There is some upward trend, but it's not statistically significant, because there is a lot of variation in the participation year to year. The second reason is that even the people in the leading positions have slower times year to year. 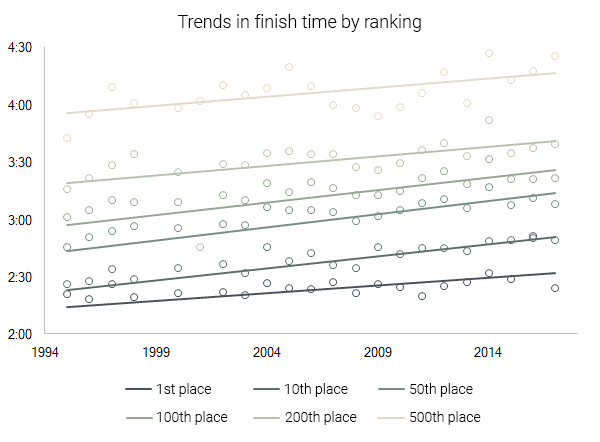 As we can see in this graph, even the finish time of the person taking 1st place has risen significantly in the last 13 years. And this is also the case for the 10th, 50th, 100th, 200th and 500th position. As we all know, women are slower runners on average. 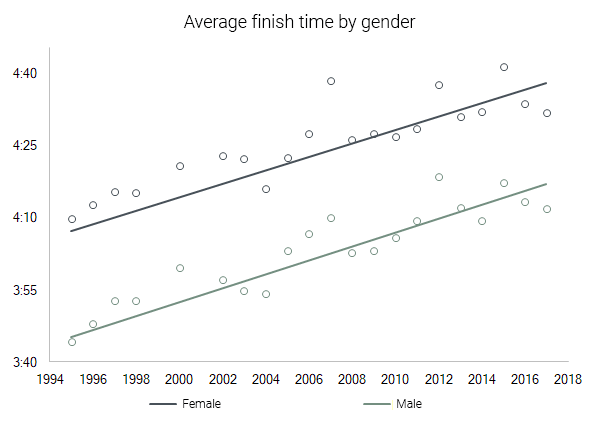 So, with more women joining the race, the average finish time is bound to increase. It is true that more women are joining the Rocket city marathon. But are women the only ones at fault? 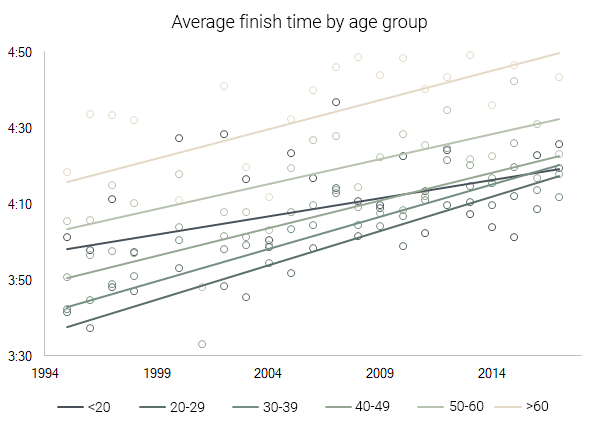 As we can see, men and women are slowing down at an equal pace, so even if only men were joining the race, the average finish time will still be going up. Here, the assumption is that elderly people are slower, so more elderly people means slower averages. This could be true if there was some significant change in the age distribution of the participants. But there isn't. 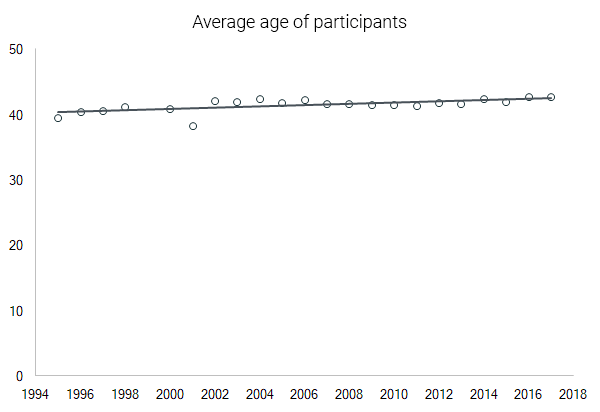 Also, the average age of the participants is quite stable as well. And it's also important to note that people of all age groups are slowing down. And actually, the younger participants are slowing down at a faster rate. So, the effect of slowing down can't be blamed on the age of the participants. There is an established trend of people, in general, getting heavier and taller. This, of course, can influence speed. And there is a strong correlation between population weight and marathon finish times finish times. And a strong correlation between population obesity rates and marathon finish times. Of course, we can't be sure that there is a causal link and that these general trends are valid for the population of marathon runners. Also, with the increased number of marathons and the increased popularity of the events, more people are running socially, without focusing on finish time. And the trend of slowing down could be due to the increased number and variety of athletic events in existence today. So, the best runners might be choosing triathlons, ultra-running or OCR, instead of marathon running. This is an interesting and important phenomenon, that needs further investigation. Vania Nikolova is a data analyst at Runrepeat.com. 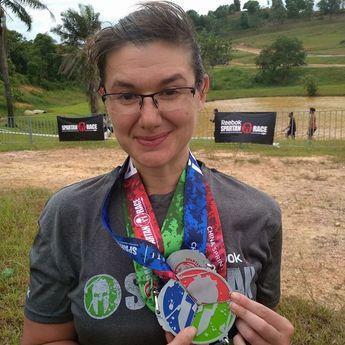 She holds a Ph.D. in Mathematical Analysis and is keen on finding interesting trends relating to running. At RunRepeat.com we give you all the information you need to buy the best pair of running shoes at the best price, base on your needs - for road or trail, minimalist, maximalist, lightweight, for daily running or for competition.